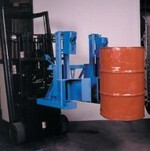 Mechanical drum grabber handles one or two drums without the operator leaving his seat. 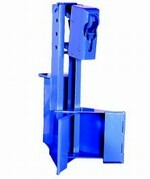 Proven mechanism and massive steel jaws grip more securely as the load increases. Works with straight wall drums, even drums with damaged sides. Welded steel construction for ultra-reliability. Capacity 1500 lbs per steel. Fork-Mount Models have drive-in 26-5/8" deep fork pockets spaced 16-1/2" apart, accepts forks up to 2-1/8" x 6-1/2". Carriage Mount Model installs directly on the fork truck carriage. Ideal for moving drums in crowded areas. Belted Back Rest Models have fabric belt on bottom drum rest. Prevents marring and scratching of drums. Caution: Good truck discipline must be exercised by carrying the load low and avoiding unreasonable surfaces and high speeds. Sudden movement over rough terrain could unweight the drum, allowing the jaws to open, dislodging the drum.